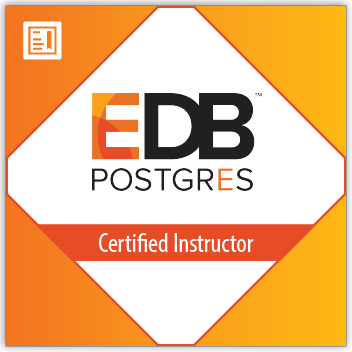 This badge is for individuals that are certified by EDB to deliver Postgres training. EDB Certified Instructors are trainers who actively deliver training on EDB Postgres and PostgreSQL technologies around the world, and are premier technical and instructional specialists. You are required to earn technical certifications validating your experience and knowledge in using Postgres for the courses that you deliver, and you must maintain certified instructor status in good standing.